I am Ozkary. I author this site, speak at conferences and events, contribute to OSS, mentor people. I use this blog to post ideas and experiences about software development with the goal to help all the technology communities around the world. The Foreign Key on table with columns could not be created because the principal key columns could not be determined. Use the AddForeignKey fluent API to fully specify the Foreign Key. This error takes place when the code first model is trying to create a foreign key to a table that is not included in the model. Since Entity Framework (EF) can’t find the model that contains the primary key association, it raises the error. We should notice how on this method we are explicitly indicating that we want to map the RoleId column to the Primay key column of Id on the Roles table. This error can take place when Visual Studio 2013 is updated to Update 4 and extended Transact-SQL verification is enabled on the database project. To fix this issue, uncheck the Enable extended Transact-SQL verification option from the project properties. If you wonder why this happened, the feature was deprecated and has been removed from the latest SQL Server tooling update which is what takes place when using VS2013 Update 4. The “A referral was returned from the server” error usually means that there is a conflict between the IP address and the domain controller (DC) defined on the connection string. That should address the problem. For project download see link at end or article. We are familiar with the use of enumerated type fields to provide category information. 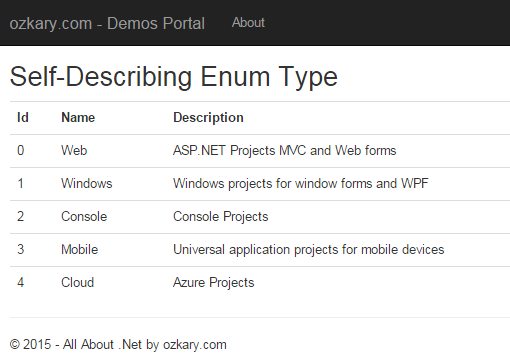 For developers, the enum type may provide enough information to understand its meaning. However, it would be ideal if the enum type could be self-descriptive and provide a detail message of what it really means which can be achieved with the use of extension methods. We know the categories that are available, but let’s say that we would like to also show more information about each of one those entries. Web category is very general, so we would like to query it and ask more about what it contains. Let’s work on an extension method to see how we can extend this type to be more descriptive. We can now use the ResourceManager helper methods to look for that resource and load the value. 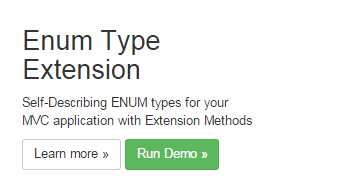 We can now see that the enum type can tell us more about itself with the help of the extension method. Since we are also using resource files, we can use localization of the resources to support other languages. Well that is some descriptive enum type. Run And Select this option. Use the content of this blog as a reference only. We make no warranties.